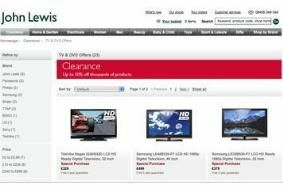 John Lewis clearance sale starts today | What Hi-Fi? It's offering Toshiba's Regza 32AV633D HD-Ready LCD TV for £329, Samsung's LE40B530 Full HD model for £499, the Samsung 1080p LE32B350 for £379, a Panasonic Viera TX-P50U10B plasma for £799 and Panasonic Viera TX-P46S10B plasma for £999. And if you want a smaller screen for the bedroom or kitchen, the Sharp Aquos LC26SH7EBK LCD is now just £299, and the LG 22LU4010 is down to £255. There are further reductions on the Sharp HTDV40H DVD home cinema system, down from £299 to £233.50 while stocks last. If you're in the market for a Blu-ray player, John Lewis is giving away three free Harry Potter Blu-ray discs with selected Samsung models including the BD-P1600, BD-P4600, BD-P1580 BD players and HT-BD1220R Blu-ray system. And for those who like their entertainment on the move, there's the Philips DCP951 portable DVDplayer/iPod dock for £155 (was £199). These and many more clearance bargains can be found in John Lewis stores or online at www.johnlewis.com.